Elsa Morante is acknowledged to be among the great European writers of the twentieth century. One of a group of leading Italian writers, artists and thinkers of the post-war period, she is probably best known in this country for her novel, La Storia, (History) first published in 1974 that drew on her experience of the Second World War. She spent a year of the war in hiding with her husband, the novelist Alberto Moravia (both were of half Jewish descent), among remote villages in the mountains south of Rome and the novel captured the impact of major political events, driven by the powerful on ordinary people struggling to survive. It is also over 300 pages long and this review can only give an indication of its content and quality. 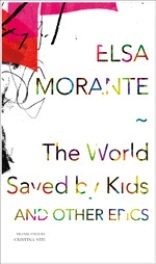 As is already clear from the title, it is the young who provide hope for Morante in a dystopian world. The second section, ‘The Chemical Comedy’, contains poems that are visionary and hallucinatory, one of which in Italian is titled La Sera Domenicale and in translation has become ‘Late Sunday Dusk’ preserving the acryonym LSD. There is a short play in this section, ‘The Evening at Colonus’ in which Oedipus becomes a blind old alcoholic detained in a hospital ward and his daughter Antigone (‘Annie’ ) is a feisty Roman kid. The play was said to be a response to the film ‘Oedipus Rex’, directed in 1967 by Morante’s friend, Pier Paolo Pasolini. The cycle shifts over time and space with cinematic bravado, from autobiographical to universal via the historical, through invented pasts and imagined futures. It includes quotes by Shakespeare, Holderlin, Tsvetaeva and Allen Ginsburg. When I was thinking which writers in English she might be close to, I naturally thought of Blake, but also of Whitman and of the best lines of Allen Ginsburg, such as the opening of ‘Howl’. But Morante is an original. There are also folk tales and songs, radio broadcasts and even musical notation. The third section ‘Folk Songs’ contains a poem ‘Song of the H.F and the U.M’ in three parts’, a philosophical exploration of the nature of happiness in the context of a materialist society (“unreality is the opium of the people”) and the relationship between the Happy Few (HF) and the Unhappy Many (UM). The names of some figures listed by Morante as the HF include Spinoza, Joan of Arc, Gramsci, Simone Weill, Rembrandt, their names typeset in the form of a cross on the page. In ‘Song of the Scaffold’ Jesus appears on the outskirts of Rome and tells the builder Simone “ALL OF THIS…IS NOTHING BUT A GAME.” The last song ends on an optimistic note. The ‘Final Song of the Yellow Star’ is lifted by the hope of a world saved by the young. Here Aryans led by school kids choose to wear the yellow star to prevent the identification of Jews. Nevertheless the last words remind us that it is all “NOTHING BUT A GAME”. I haven’t read the Italian version of the book so am only able to comment on how this translation reads in English. Cristina Viti is an experienced translator of poetry and prose from Italian, and other translations of hers (such as of the poets Dino Campana and Amelia Rosselli) are also works by unconventional writers and so present a challenge for the translator. With the exception of one section, where Annie’s Roman dialect is translated into a London voice peppered with “innit’s” that I wasn’t convinced by, this translation is a tour de force and we should thank Viti for bringing to our attention a work, considered by many (including Pasolini) to be Elsa Morante’s masterpiece.